Flip Out Mama: Hot Gift: Blue Box Toys! Hi everybody! Hope you are having a happy Monday! I am excited to tell you guys about another great baby gift today, from the awesome folks at Blue Box Toys! We were really excited to review a couple of toys from Blue Box Toys "B Kids" line. "B Kids" is a relatively new line of toys from Blue Box Toys, debuting in 2010. They have some really adorable toys! 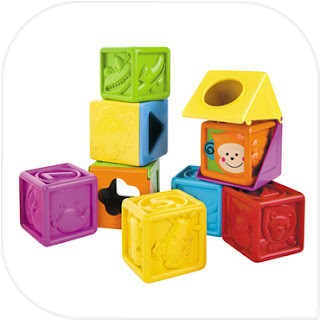 The first toy we got to try out was the Soft Peek A Boo Blocks! These are designed for ages 6 months and up. This is a 10 block set, and each block is different. 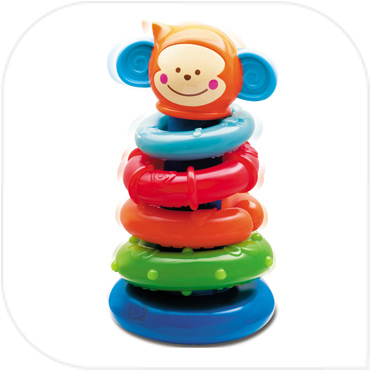 Each one rotates, opens up, is a different bright color and is super fun for babies. These blocks are really cute and have kept my Bean entertained. I was a little worried since he is almost 18 months old now, and I thought these would be to "babyish" for him! But nope, he has really enjoyed playing with them and I think that the extra touches that the blocks have and all the little details make them even more fun! At $19.99, these blocks are super affordable too! The second toy that we got to review was the Stack And Link Pal. It is such a cute toy! There are four rings to stack and a cute little monkey on top. Each ring has different textures to explore. A really cool thing about this toy is that you can actually link up the rings too. Bean also really liked this toy. I was surprised that he is big enough to stack the rings together already! He also likes throwing the rings at his brother, but... is that really any surprise to anyone? "B Kids" has some really great toys for babies and toddlers! No matter what you are looking for, they got you covered! Make sure to follow "B Kids" on Twitter and Facebook to stay up to date with all their latest news and promotions!